PSNews – The final round of Vietnam – China friendship singing contest will be held on November 10 night at Hanoi-based Au Co Arts Center, according to Deputy Director of Vietnam National Theater of Music and Dance. The contest promoting bilateral cultural exchanges between Vietnam and China. Photo: hanoimoi.com.vn. 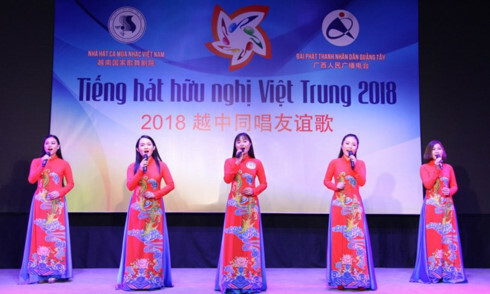 The “Vietnam – China friendship singing contest” is considered a special cultural exchange activity, contributing to promoting the relations between Vietnam and China as well as fostering musical talents. The annual event is jointly held by the Vietnam National Music Song and Dance Theatre and the People’s Radio of Guangxi. The contestants, comprising 18 individuals and three bands, stood out in the qualifying rounds held across Vietnamese regions in mid-October. On November 10 night, each of them will perform a Chinese song and another in Vietnamese, and the best five will come to Guangxi, China, for the final slated for November 28. Deputy Director of Vietnam National Theater of Music and Dance Hoang Xuan Binh said that the final round of Vietnamese contestants will be judged by seven famous people including three Vietnamese artists and four Chinese people.